A piranha is a ferocious freshwater fish. Piranhas are cannibals (eat their own species). They will attack and eat other piranhas when other meat sources are not available. Piranhas live in lakes and rivers in South America. Scary movies represent piranhas as ferocious man-eaters that can eat human body in just a few seconds. Although they live and feed in large groups, piranhas need more time to finish large prey. Groups of piranhas are known as "schools". School consists of 1000 of fish. They require warm water to survive and do not eat when the water temperature is less than 12°C (54°F) degrees Fahrenheit. Dolphins, crocodiles and turtles are the biggest enemies of piranhas. The total number of piranha species is unknown and contested, and new species continue to be described. Estimates range from fewer than 30 to more than 60. Mating takes place during rainy season in April and May. They live up to 25 years in the wild and 10-20 years in captivity. Females can lay up to 5000 eggs. Just like sharks, piranhas are equipped with special sensory organs which help them detect blood in the water. Since both males and females take care of eggs, 90% of eggs survive until hatching. Piranhas are normally about 15 to 25 centimeters (6 to 10 inches) long, although some specimens have been reported to be up to 50 centimeters (20 inches) in length. Piranhas range in color from yellow to steel-grey to bluish to partly red to almost black. A piranha’s mouth is lined with a single row of razor-sharp, triangular teeth. They have a distinct under-bite, which means the bottom row of teeth is constantly exposed. Local people use piranha's teeth to make weapon and other tools. It’s not uncommon for piranhas to lose teeth throughout their lifetime. But, while sharks replace their teeth individually, piranhas replace teeth in quarters multiple times throughout their lifespan. Most piranhas are shy and non-aggressive, unless they are hunting or protecting their young. Black piranhas and red-bellied piranhas are considered the most dangerous and aggressive toward humans. Despite the carnivorous nature of the piranha, the piranha is actually an omnivore and will eat almost anything that it can find. Their jaw bone is so strong, that it can crush a human hand in 5-10 seconds. A typical piranha diet consists of insects, fish, crustaceans, worms, carrion, seeds, fruit and other plant material. They will also eat whatever meat crosses their path, and because they hunt in groups, they can take down large animals. Piranhas rarely attack humans. Fatal attacks are extremely rare. These voraciously hungry fish tend to have a lurk-and-ambush style of attack that occurs en masse, with large groups of piranha feeding at once. Shoals of piranhas can be found in numbers of up to 1000. Their sharp and pointed teeth are arranged in a single row. They can bite through hook made of silver. Most people think that piranhas have insatiable appetite for blood, but they are actually omnivores animals (eat animals and plants). They usually eat snails, fish, aquatic animals and plants, seed and fruit. They will feast on mammals and birds when they fall into the water, which doesn't happen that often. Various stories exist about piranhas, such as how they can dilacerate a human body or cattle in seconds. These legends refer specifically to the red-bellied piranha. Experiments have shown that piranhas have an amazingly acute sense of smell, which aids them in locatin food in the often murky waters of their native habitat. Piranhas have the standard respiratory system that most fish have. They take water in through their gills and then absorb oxygen from the water. The oxygen then goes to the blood stream. After the oxygen is absorbed the carbon dioxide is exhaled through the gills. Piranha can be 5.5-17 inches in length and weight about 7.7 pounds. The female lays around 5000 eggs then the male will fertilize the eggs. The male will then protect the eggs and become very territorial of them. The piranhas will spawn from the eggs after a few days. They have two spawning periods, one in April/May and a second in the late summer time. Many animals prey upon piranhas (especially young piranhas), including other piranhas, larger fish, caimans, water snakes, turtles, birds, otters and people. The word piranha literally translates as “tooth fish” in the indigenous Brazilian language of Tupi. Piranhas have silver body covered with red patches that serve as camouflage in muddy waters which they inhabit. Native people of South America use piranha teeth for tools and weapons. When American President Theodore Roosevelt visited Brazil in 1913, he went on a hunting expedition through the Amazon Rainforest. While standing on the bank of the Amazon River, he witnessed a spectacle created by local fishermen. After blocking off part of the river and starving the piranhas for several days, they pushed a cow into the water, where it was quickly torn apart and skeletonized by a school of hungry piranhas. Piranhas can be bought as pets in some areas, but they are illegal in many parts of the United States. It is illegal to import piranhas into the Philippines and violators could face six months to four years in jail. The most common aquarium piranha is Pygocentrus nattereri, the red-bellied piranha. 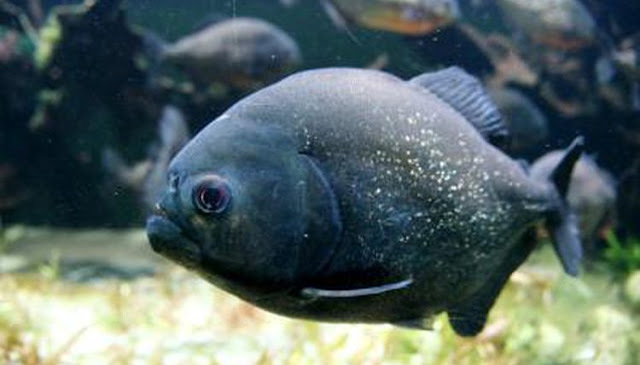 Films have often portrayed piranhas as aggressive, insatiable predators. Piranha (1978) and Piranha II: The Spawning (1981) perpetuated the piranha’s sinister image by showing murderous piranha fish biting and eating humans. In the 2010 film Piranha 3D, a previously unknown piranha is discovered. Fossil evidence puts piranha ancestors in the continent’s rivers 25 million years ago, but modern piranha genera may have only been around for 1.8 million years. Piranhas have also been discovered in the Kaptai Lake in southeast Bangladesh and in the Lijiang River in China. Research is being carried out to establish how piranhas have moved to such distant corners of the world from their original habitat.